The Rosetta orbiter, as part of a mission to conduct the most extensive research on any comet ever, has captured a stunning – both visually and scientifically – picture of a comet in line with the sun. The Rosetta orbiter is still going strong after a failed mission to land a transmitter on the surface of the 67P/Churyumov-Gerasimenko comet. 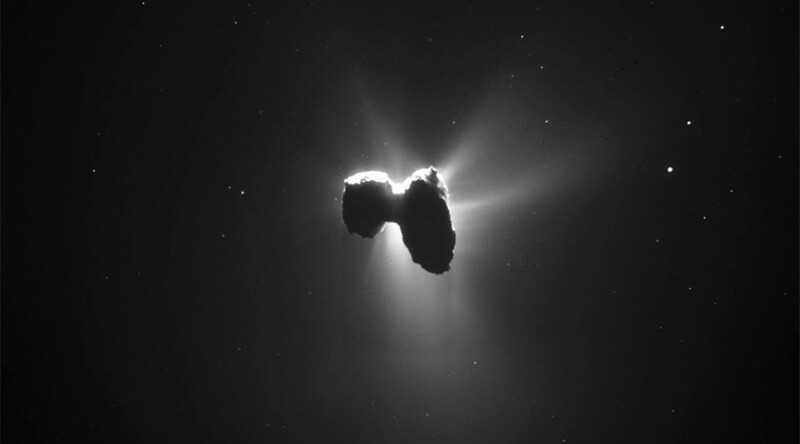 On Friday, the mothership released photos of Comet 67P from a distance of 200 miles. When the Rosetta orbiter was on its outward leg of a roughly 600-mile journey, it was 200 miles away from Comet 67P. That was close enough to snap a spellbinding picture as the spacecraft lined up with the comet and sun. The strange, double-lobed shape of the comet could be the result of a low-velocity collision between two objects, Gizmodo reported. Comets are believed to be composed of mostly gas, dust, and ice, but the specifics are still unknown. The interest in comets like 67P is related to their age. Scientists believe that it was likely formed at the beginning of our solar system’s history, according to The Washington Post. Therefore, studying the material of the comets can help scientists learn what materials were available at the earliest stages of our solar system.